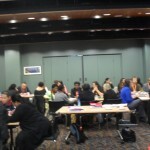 Over the last two years Creative Cognicion, as part of the Complexability group, has been working with a group of librarians across the South Pacific. They have been undergoing leadership development training which is funded by the Bill and Melinda Gates Foundation. Part of the development of the program was to rake an existing world wide program and adapt it to the specific needs of participants in the South Pacific. So rather than wait until the end of the first Cohort and then evaluate the program and hurriedly make changes for the second cohort, an impact evaluation was undertaken which could give real time feedback. The methodology was based on Cognitive Edge techniques including the use of their software Sensemaker. This was chosen for several reasons. One is that it is appropriate for the complex nature of learning and development. It provides experiences of the participants, and contextualization reached through the participants making their own meaning of their experience. This gives rise to insights which can be turned into actions for change. The actions can be designed by either the Steering Committee or the participants. Secondly, the methodology is consistent with reflective learning as participants are asked to record experiences and then make their own meaning of the experiences. This is similar to the requirement of the course to keep a reflective journal, so participants are being provided with the opportunity to undertake reflective learning in a number of ways. And thirdly it is consistent with the development of innovation capability, one of the outcomes of the program, as it is a “different ” way of undertaking evaluation and encourages participants to think and plan about change. Cohort 2 has just commenced with the program incorporating changes emerging from the experiences of Cohort 1. And it is expected that Cohort 2 will again influence the development of further programs. This entry was posted in complexity, narrative research, student learning and tagged cognitive edge, evaluation. Bookmark the permalink.